The Tot Orchard is a safe place for our youngest visitors (0-3) to explore. Pick apples, cherries, and peaches from fruit trees. Push a fruit cart and fill up the tractor. Bake a pie or applesauce in the orchard kitchen and serve it at the picnic table, or simply take a jaunt up the stairs and down the ramps. Orchard crates and an apple bushel hold popular busy board activities. Play peek-a-boo at the windows, feel air whoosh, turn on lights, and create faces. Ample seating makes this a restful space for adults and kids alike, and a nearby nursing and reading area provides privacy and down time. Play with bee hand puppets and pollinate the Tot Orchard! 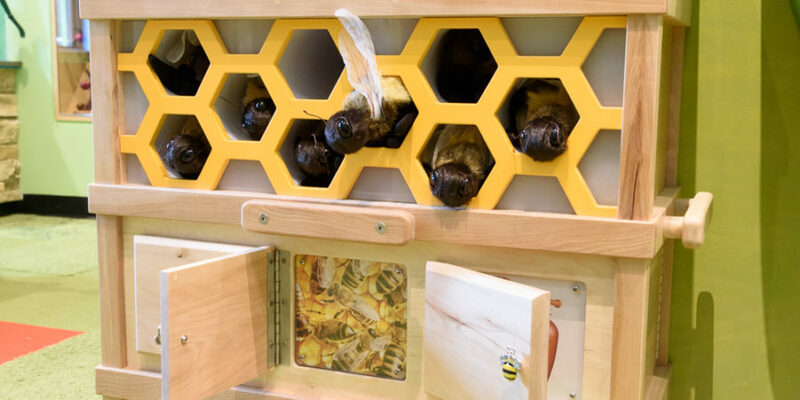 Fly around from fruit tree to flowers and back home to the Bee Box hive. Kids have fun getting to learn the importance of the bee’s role in nature. 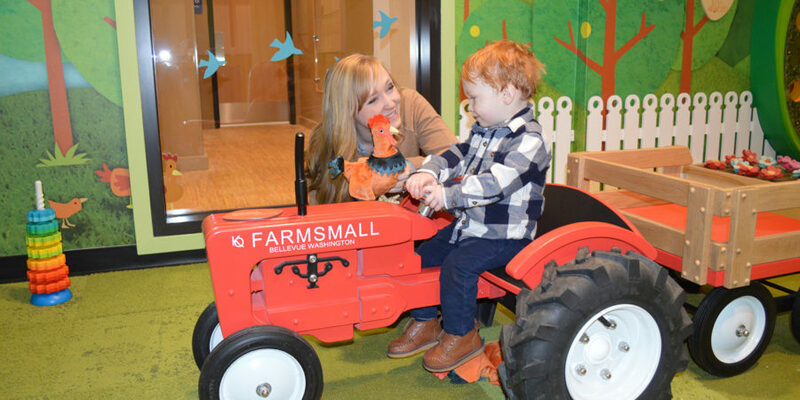 Climb aboard this kid-sized agricultural vehicle and play out all kinds of adventures in the orchard and beyond. Explore sounds and pictures and move shapes on apple faces to reflect the wide range of emotions felt by your little one. Experience the joy of play cooking in a kitchen with an outdoor feel. Grill up some goodies and enjoy an old fashioned barbecue or picnic in the orchard. 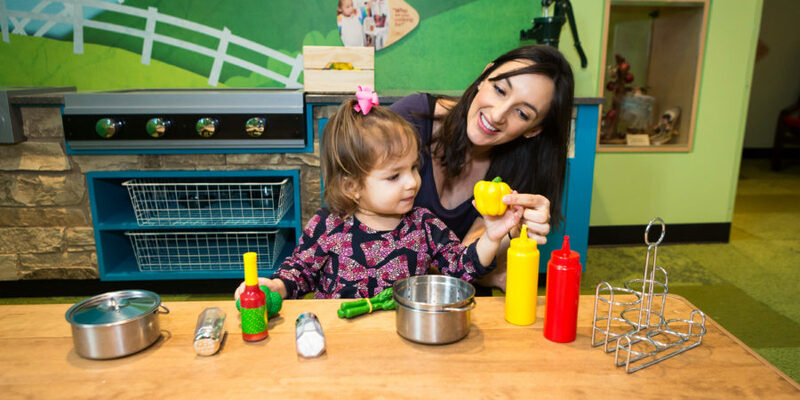 Creativity of the young chef is limitless here as concepts of nutrition and taste are imagined and formed through imaginative play. The Orchard Trees define the ambiance of the Tot Orchard. Play fruits can be picked, gathered, sorted, and rolled down whimsical ramps. 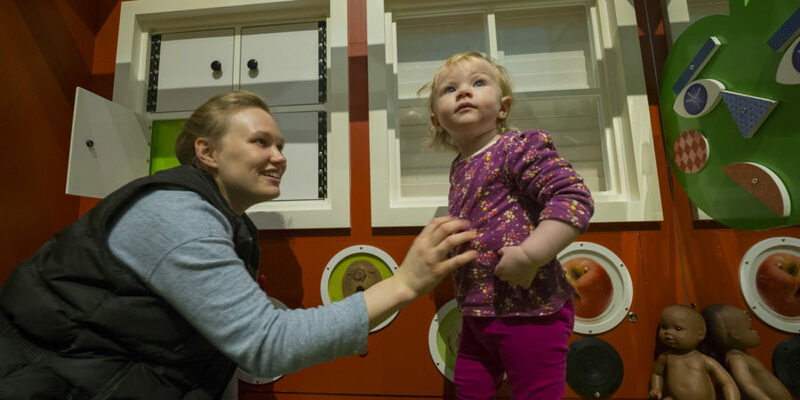 KidsQuest’s youngest visitors explore new places to find and store their discoveries from trunk to lofty peak. Shhh Station Sponsored by Wallace Properties, Inc. The Shhhh Station is a quiet area separated from the main Tot Orchard. 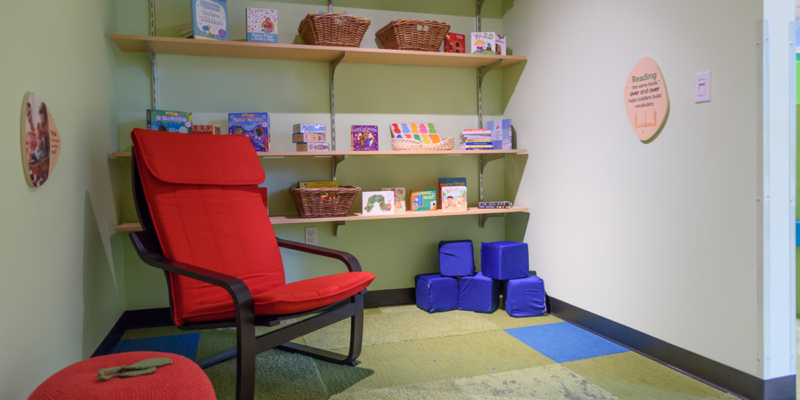 Seating and books are found in this welcoming space for grown-ups who need to spend time with their smallest or most sensitive children, or for those who would like a more private area to nurse. 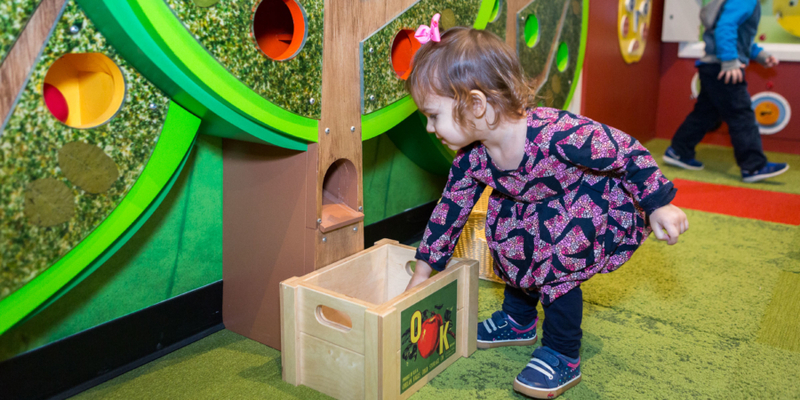 A gross-motor experience with fun, interactive discovery, the Steps & Slide Away lets KidsQuest’s youngest visitors explore by crawling, climbing, and sliding around this exhibit. 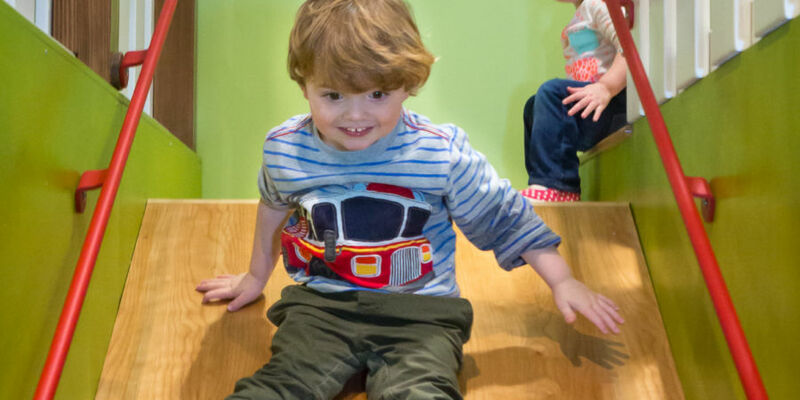 Little ones explore fun, basic physical obstacles that develop their spatial awareness, balance, posture, and strength. Toddlers wind toy trains through a miniature landscape at the Train Table. 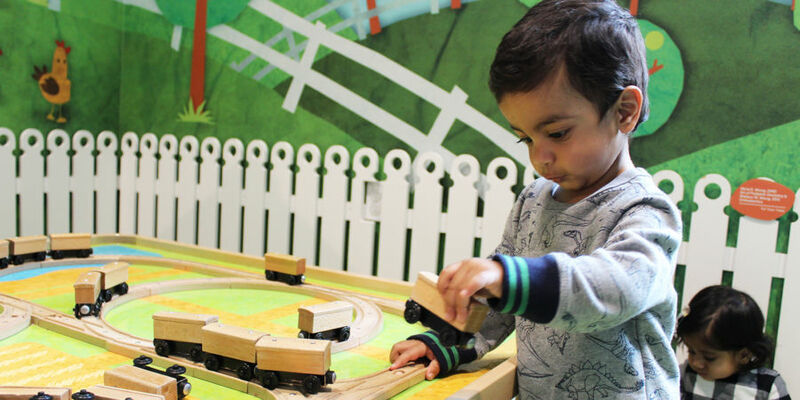 Finger manipulation begins the journey of fine motor development as kids feel the wheels of the train cars in the grooves of classic, warm, wooden tracks. Early math skills are learned at the Train Table by adding more and more cars onto a train line.